1 of 4 Whirl in a blender or food processor until smooth: cilantro, lime rind, lime juice, oil, jalapeno, garlic, salt, cumin and pepper. Combine marinade and flank steak in plastic food-storage bag. Refrigerate overnight. 2 of 4 Prepare outdoor grill with medium-hot coals, or heat gas grill to medium-hot, or heat oven broiler and coat broiler-pan rack with nonstick cooking spray. Remove steak from marinade. Discard marinade. 3 of 4 Grill steak or broil 2 inches from heat until instant-read thermometer inserted in center registers 145 degrees F for medium-rare, about 4 minutes per side, or until desired doneness. 4 of 4 Remove flank steak to cutting board. Let rest for 10 minutes. 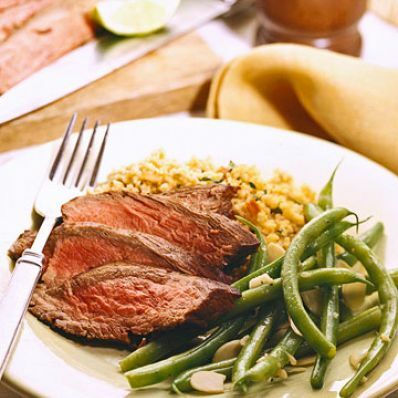 Cut flank steak diagonally across grain into thin slices. Makes 6 servings.